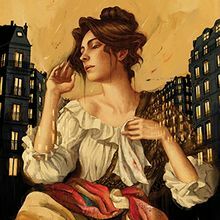 Vancouver Opera opens its season with La Boheme and Vancouverites will experience Bohemian life in 19th century Paris in Giacomo Puccini’s irresistible and heartbreaking masterpiece, La Bohème. The world’s most popular love story comes to life onstage for five performances only at the Queen Elizabeth Theatre from October 20 – 28, 2012. Opening night is Saturday, October 20, 2012, with subsequent performances Tuesday, October 23; Thursday, October 25; Saturday, October 27 at 7:30pm and a matinee performance on Sunday, October 28 at 1:30pm. All performances take place at the Queen Elizabeth Theatre, Georgia and Hamilton Streets, Vancouver, B.C. Tickets are available exclusively through the Vancouver Opera Ticket Centre, online at www.vancouveropera.ca or by telephone (604-683-0222). See complete ticket information below. La Bohème is beloved for its glorious music, heartbreaking love story and tender combination of pathos and humour. VO’s production combines evocative sets on a grand-opera scale and lavish costumes with a fresh young cast who bring new depths of emotion to an eternally effective and moving classic. Making her VO debut will be soprano Marianne Fiset as the delicate, sensitive Mimi. Born in Quebec City, Ms. Fiset has sung with several companies worldwide, including Opera National de Paris, Orquestra Sinfonica Madrid and Orchestre Métropolitain, under the baton of Yannick Nézet-Séguin. “Little can dampen a performance of La Bohème when you have a great Mimi in soprano Marianne Fiset” praised the Montreal Gazette. Tenor Jason Slayden makes his Canadian debut as Rodolfo, the writer. A Metropolitan Opera National Council semi-finalist and winner of the 2011 Gerda Lissner Foundation First Prize, Mr. Slayden has been praised for the warmth and beauty of his voice and for his charismatic stage presence. Baritone Aaron Durand sings Schaunard, the musician. Mr. Durand began his opera studies at the Victoria Conservatory of Music. He transferred to UBC in 2007 and has since performed lead roles in Così fan tutte, Louis Riel, Die Zauberflöte, Cendrillon, Albert Herring, and The Merry Widow. He is currently participating in the inaugural year of VO’s Yulanda M. Faris Young Artists Program. The director is Nancy Hermiston, Director of the UBC Voice and Opera Division and recipient of a Dorothy Somerset Award for Performance and Development in the Visual and Performing Arts. Ms. Hermiston’s last VO engagement was at the helm of 2004’s La Traviata. VO’s Chorus Director and Associate Conductor Leslie Dala will lead the VO Orchestra. Mr. Dala was last seen in the orchestra pit as conductor of 2011’s West Side Story. The set designer is Erhard Rom, who has won international praise for his design of VO’s 2010 Nixon in China. 19th century Paris. The Latin Quarter is impoverished, yet it pulses with the energy and passion of young artists. On Christmas Eve, Mimi and Rodolfo meet and fall deeply in love. Their happiness is cut short as Mimi’s worsening health drives them apart. When they are reunited in the warmth of spring, it is too late. Mimi dies in Rodolfo’s arms, with their dear friends close by. Puccini’s La Bohème was based on Henri Murger’s popular 1845 collection of stories, Scènes de la Vie de Bohème. The stories depicted the lives of a group of young Parisian ‘Bohemians’, a label made more popular by Murger’s stories. Puccini based his cast of characters on those in the stories: the philosopher Colline, the poet Rodolfo, the painter Marcello, the musician Schaunard, the singer Musetta and the seamstress Mimi. When Puccini decided to compose the opera, his friend Ruggero Leoncavallo was working on an opera based on Murger’s stories, also called La Bohème. The friendship was destroyed by the rivalry. Leoncavallo completed his opera a year after Puccini did, but Leoncavallo’s is almost never performed (although Leoncavallo gained great fame for his 1892 opera I Pagliacci). The 1996 rock opera Rent is loosely based on La Bohème, but set in New York instead of Paris. Instead of tuberculosis, the Mimi character is infected with AIDS. Single tickets are available from the Vancouver Opera Ticket Centre, online at www.vancouveropera.ca, or by phone at 604-683-0222. Visa, MasterCard and American Express are accepted.